The name of WVT has been a synonym for technically perfected and functional technology in environmental engineering for more than 50 years. As specialists for flue gas dust collection systems and hot gas blowers, WVT engineers have developed biomass furnace systems specifically for energetic utilisation of wood in its various forms under the trademark of Bioflamm®. Bioflamm® plants are planned and built as complete systems from fuel storage and discharge to feeding of the furnace with boiler and automatic control to flue gas dust collection and chimney. 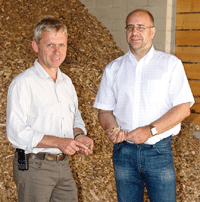 As a manufacturer of complete systems, we are not only a partner for commercial and industrial wood processors, but also for German suppliers of local and district biomass heating concepts for municipal and trans-regional heat suppliers. We have delivered around 4,000 systems worldwide so far. Our leitmotif of providing expert advice to our customers makes us a reliable and respected partner in all phases of energy supply engineering. Hier wird ein Text stehen. Christoph Zeis (Managing Director) As a local contractor and a specialist in energy management, we are "repeat offenders" in terms of biomass heating plants. 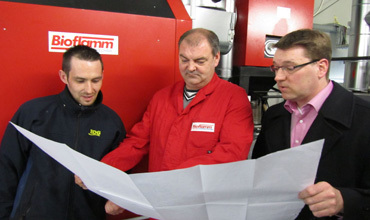 Meanwhile, operate and look after 11 heating plants with Bioflamm ® boilers. The key criteria for Bioflamm ® for us were the sophisticated technology both in the field of pyrolysis option as well as the Integralfeuerung alongside the ever-competent collaboration on preliminary design to decrease and consequently the care in maintenance and repair issues. Conclusion: both successful and enjoyable business relationship! Karsten Sierk (Head of Forest Enterprise) Our monastery was heated centuries ago with wood. The price of oil has led us to us to reflect back on the energy wood and build a modern wood chip heating with district heating network to supply heat to our historic buildings. 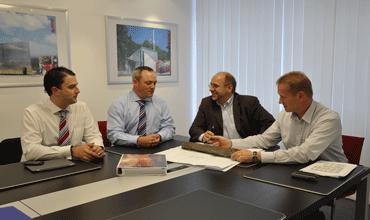 After a feasibility study, we caught up with offers from numerous manufacturers. The Bioflamm ® firing seemed to us to be the most robust. Experience to date confirm this impression. Another advantage is the low cost of cleaning and maintenance. Susanne Rochler (Managing Director) As for us over 10 years ago decency to purchase a new heater, we have extensive information and considered various systems. For Bioflamm we finally decided because our accumulating waste wood can be exploited without expensive drying or post-processing and the system could be integrated into our existing premises. To date, the system runs reliably and without major disruptions. 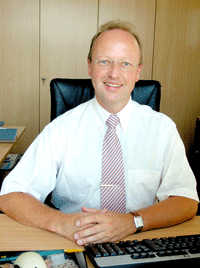 Frank Klein (CEO) We heat for 15 years with a Bioflamm ® boiler our wood market and two drying chambers. We especially appreciate the robust technology and the expert staff. Since the heater is not only environmentally friendly, our residual wood utilized, but for us is a capital good, we are dependent on reliable technology. 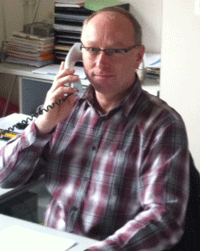 Holger Rödig (Technical Manager) As woodworkers it is natural for us to use our chips and wood residues for energy. At Bioflamm ® we appreciate the reliable and robust technology, and advanced combustion technology. Our system has worked for years with minimal disruption and caused up to now hardly repair and / or replacement costs. The man power, which we must ascribe the plant is very manageable. In terms of consultation, planning and "pastoral care" by competent people I would plan the next plant again with Bioflamm ®. 4 Good reasons to decide for us! We have more than 50 years experience in the construction of wood combustion. More than 4,000 systems delivered worldwide speak for themselves. Take advantage of this know-how. Many of our long-time employees are available for this tradition. "No egg is like the other" - to find the appropriate system concept for the local conditions and specific requirements of each customer, our engineers and technicians are at your disposal. Whether Haustechnikplaner, architect, structural engineer, builder or installer - we get us a good time and gewerk across, to make your projects successful. As a medium sized, owner-managed family business we have our ear directly to the customer. Quick decision-making, and a highly motivated team are the guarantee of a high level of customer satisfaction. Our wide range of products of different furnace and boiler systems puts us in a position to respond flexibly to the needs of our customers. "We get the value of your investment" - Just as your car and your boiler needs every now and then a check. For this, we maintain a network of service professionals have the decades of experience and the necessary manual skills. You have the choice between a regular inspection or the request if necessary. For each system operates only as good as its technical condition allows it!